A major achievement of the Naxalbari movement was giving Dalits, adivasis a sense of self-respect, says Telugu writer Vara Vara Rao. The Naxalbari movement began 50 years ago, and is still on. 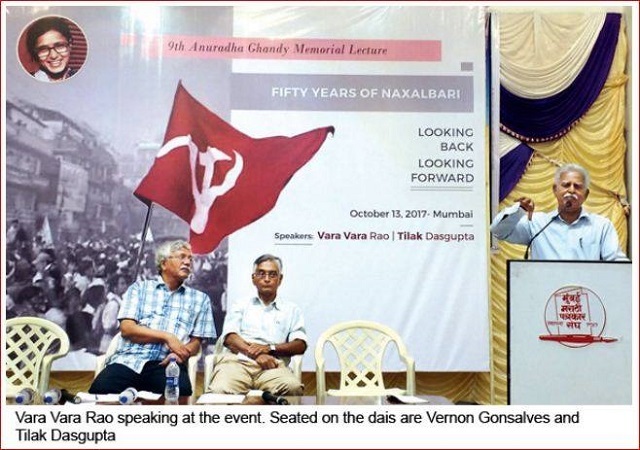 ʹNowhere else in the world will you find a continued class struggle that has lasted so many years,ʹ said Vara Vara Rao, the famous Telugu poet and writer, speaking on ʹ50 Years of Naxalbari, Looking Back, Looking Forwardʹ. Rao was delivering the ninth Anuradha Ghandy Memorial lecture at the Mumbai Marathi Patrakar Sangh. Ghandy, an alumnus of Elphinstone College, became part of the central Committee of the CPI (Maoist). She passed away from cerebral malaria in 2008. Since then, her colleagues have held an annual lecture in her memory. A remarkable achievement of the Naxalbari movement was giving Dalits and adivasis a sense of self-respect, he said. The movement had also brought forth an ʹalternative to parliamentary politicsʹ, Rao said. Describing the parallel government that exists in the forest region spread across the states of Chhattisgarh, Maharashtra, Andhra Pradesh, Orissa and Jharkhand, Rao said this was a government based on ʹpeopleʹs power. They donʹt fight elections, they donʹt pay taxes. This seizure of power started with liberating land from the hands of landlords and forming co-operatives, and protecting this land from the landlordsʹ armies and the policeʹ. According to Rao, power in this parallel government was shared by a ʹunited front of adivasis, Dalits, small and middle farmers, and the landless, all protected by a peopleʹs army. This has been in existence since 13 years, and has survived in the face of the harshest repression in the form of Operation Green Hunt under the UPA government, and now an all-out war under the NDA governmentʹ. Dasgupta said the challenge before the movement was to break out of its narrow confines and reach wider sections of the people – the working class, as well as the small producers and farmers who were fighting a lastditch battle against big corporates. హిప్నాటిజం చేసి డబ్బులు దోచుకున్నాడు ! పూణేలో హత్యకు గురైన ప్రముఖ హేతువాది నరేంద్ర దబోల్కర్‌ కుమార్తె ముక్తా దభోల్కర్‌ కూడా హిందూత్వ తీవ్రవాదుల హిట్‌ లిస్టులో ఉన్నట్టు మహారాష్ట్ర తీవ్రవాద వ్యతిరేక కార్యకలాపాల బృందం (ఏటీఎస్‌) తెలిపింది.